For twenty years serving the community from Pizza to Prime Rib. Over 20 Draft Beer's on tap, & over 200 different bottle beers available. 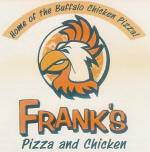 You'll say..."No Thanks if it's not FRANK'S"
Located in Bellevue PA we offer Appetizers, Soups, Salads, Pasta Parmigiana, Seafood, Chicken Wings, Calzones, Sandwiches, Stromboli, Pepperoni Rolls, Hoagies, and a wide variety of our famous Homemade Italian Pizzas, sold by the slice or pie. Stop in for Luigi's Daily Lunch SPECIALS. 11am - 9pm Mon. - Wed.
11am - 10pm Thur. - Sat. offers a national directory of more than 8,500 restaurants and a number of exclusive online merchants. You search by state, city, neighborhood, zip code and cuisine type to find the perfect restaurant and gift certificates for savings. flameCT for Cranberry or flameNH for North Hills. From one to ninety one we have the right choices for any savory taste. and for your evening entertainment Bar & Lounge. When your in Dormont don't forget to stop in... parking in rear.